Industry Experts, Inc. unveiled an updated 2018 version of its global market report on Glass Wool Insulation. The new report entitled “Glass Wool or Fiberglass Insulation – A Global Market Overview“, reveals North America is the largest region for Glass Wool volume consumption in the Residential Construction sector while Europe is the leading global region for Glass Wool volume consumption in Commercial & Industrial Construction applications. Whereas Asia-Pacific is projected to exceed all other regions in terms of growth, with a 2017-2024 compounded annual rate of 5.6% account for a consumption of 443.6 thousand metric tons by 2024. Asia-Pacific region is expected to record a robust growth of 5.2% per year through 2017 to 2024, attributed to rising building construction activity and growth in industrial, HVAC and appliances sectors. Particularly, China and India are projected to record the fastest growths in glass wool insulation demand. 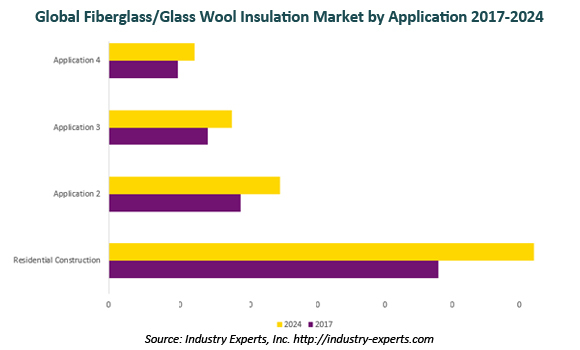 Recovery in residential and commercial construction activity and stringent energy efficiency standards and codes will boost glass wool insulation demand in developed regions such as North America and Europe. Apart from demand from construction sector, Asia-Pacific’s demand for glass wool or fiberglass in industrial, HVAC and appliances sectors is also projected to rise significantly in the analysis period, primarily attributed to China. Cornering an estimated share of 45.1% equating to US$3.9 billion in 2017, the global value market for Glass Wool/Fiberglass Insulation is the largest for Residential Construction applications, which is anticipated to witness the fastest CAGR of 3.9% during the aforementioned period. The study analyses the market in terms of volume consumption in metric tons as well as value consumption in US$ dollars. Market for Glass Wool (or Fiberglass) Insulation products analyzed for the end-use application areas includes Residential Construction, Commercial & Industrial Construction, Industrial & HVAC Applications and Appliances & Other. The report reviews, analyses and projects the Glass Wool or Fiberglass Insulation market for global and the regional markets including North America, Europe, Asia-Pacific and Rest of World. The regional markets further analyzed for 14 independent countries across North America – the United States and Canada; Europe – Germany, France, Italy, the United Kingdom and Spain; Asia-Pacific – China, Japan, India and South Korea; Rest of World – Russia, Turkey and Brazil. This 230 page global market report includes 149 charts (includes a data table and graphical representation for each chart), supported with a meaningful and easy to understand graphical presentation, of the market. The statistical tables represent the data for the global market by geographic region, Product Segment and application area. This report profiles 7 key global players and 45 major players across the North America – 9; Europe – 9; Asia-Pacific – 18; and Rest of World – 9. The report also provides the listing of the companies engaged in the manufacturing and supply of fiberglass or glass wool insulation. The global list of companies covers addresses, contact numbers and the website addresses of 54 companies.